The Eden Raised Garden Table by Riverstone (RGT-34) is the Ideal Vegetable & Herb Growing system. The unit blends into all environments nicely and can be stained or painted to match any exterior setting including your porch or deck. The elevated growing surface and covering system allow it to accomplish things a standard garden cannot, similar to a greenhouse. The best and most nutritious vegetables come from warm, rich, weed and pest free soil. The Eden Raised Garden Table's elevated growing surface is always substantially warmer in the spring than the ground level under it. Possibly the best feature is gardening while sitting on a stool or bench. 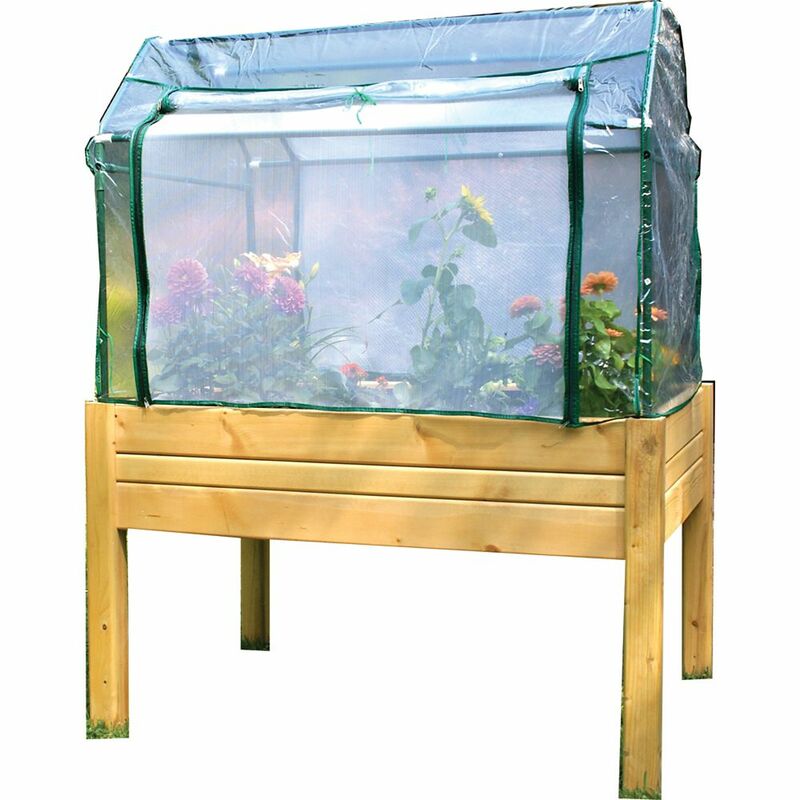 Also Included is the OPTIONAL UV protected covering (RGT-T34) with protective mesh netting to keep insects and rodent out, trap the sun's warmth while allowing air to flow within the garden. Raised Garden Table With Optional Enclosure (Large) The Eden Raised Garden Table by Riverstone (RGT-34) is the Ideal Vegetable & Herb Growing system. The unit blends into all environments nicely and can be stained or painted to match any exterior setting including your porch or deck. The elevated growing surface and covering system allow it to accomplish things a standard garden cannot, similar to a greenhouse. The best and most nutritious vegetables come from warm, rich, weed and pest free soil. The Eden Raised Garden Table's elevated growing surface is always substantially warmer in the spring than the ground level under it. Possibly the best feature is gardening while sitting on a stool or bench. Also Included is the OPTIONAL UV protected covering (RGT-T34) with protective mesh netting to keep insects and rodent out, trap the sun's warmth while allowing air to flow within the garden. Raised Garden Table With Optional Enclosure (Large) is rated 3.9 out of 5 by 7. Rated 1 out of 5 by Juice from I was thrilled with these when I first got them. They are a fun little set up. The problem is tha... I was thrilled with these when I first got them. They are a fun little set up. The problem is that after one New England winter all three are broken. Rated 1 out of 5 by HomeDepotCustomer from Material was dried out, very cheap. When put together ends... Material was dried out, very cheap. When put together ends split apart. Had to glue and screw to hold together. Not happy at all with this product. Would think twice about purchasing another product like this. Rated 5 out of 5 by SkaterGuy from Have this garden bed with the optional cover as seen. The benefit of getting the garden bed with ... Have this garden bed with the optional cover as seen. The benefit of getting the garden bed with the cover is that you can start to grow sooner than you would without the protection and heat kept under the cover. As it gets warmer you can always take the top and framework off. Would definitely recommend.